Hostal Moreno i Valencia, Spanien : Boka nu! The hostal will not load expenses if it is annulled 48 hours of the day of arrival. In case of annulling with less of 48h or in case of not presentation, the Hostal will load the amount of the first night. This quiet hotel is located in Silla. Silla is 12 km to the South of Valencia. You can go to Valencia by car or by train in about 17 minutes. Silla is near a natural park called: Albufera. Apart from that, you can enjoy the wonderful beaches, the sigths, guided bus tours and the lively night of Valencia. 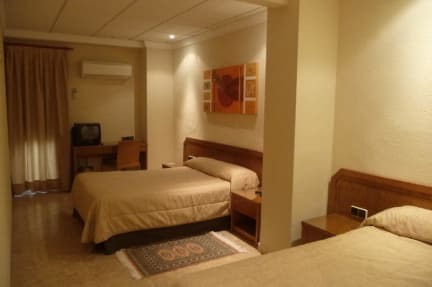 All rooms have: bathroom, television, free wifi access and air conditioner. 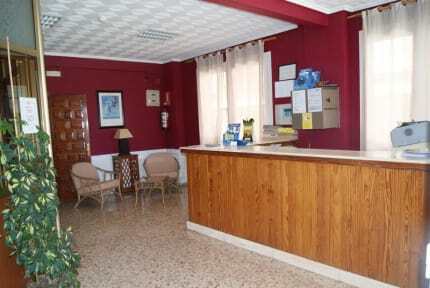 Sized family rooms are available and some of them have balconies that overlook the Albufera lake. FACILITIES: The Property is open 24 hours. Free WiFi throughout the building. Luggage storage service, bar and a restaurant for dinners from Monday to thursday. Early risers can still have a hearty breakfast thanks to the opening hours form 06:00. Dinner is served from 20:30 until 23:00. Visit the local market of Silla which takes place every Thursday and learn about the local lifestyle. There are lots of restaurants and shops to visit in. There is also a public sports centre and a swimming pool. Check in from 1 p.m.. Check out at 12 p.m..
Wel will not charge any money if the book is cancelled 48 hours before the arrival day.. In case of cancellation within the previous 48 hours to the arrival time, the Hostal will charge the amount of the first night.